These two volumes finish off the Band’s tour and culminate with the long awaited Black Kitty/ In No Hurry showdown. In NO Hurry dominated the tour series and were a surprise hit. They garnered many new fans and some intense interest over the weeks. Black Kitty could feel the pressure and also performed one of their best sets ever. As the fans boiled over into a frenzy, Momo suggests that the two bands do a joint encore together. Both bands are shocked by the proposition but excited to see how the fans would react to a thrilling encore. Miou and Nino take center stage to sing together while Yuzu and Momo stand on either side. The fans go wild as the bands crush their encore. And just like that, the concert series is over and they prepare to go back to regular life. There have been whispers going around about the true identities of In No Hurry. Someone thinks they recognize Yuzu from school and starts to spread a rumor that puts the band back in the spotlight. Nino, Yuzu, and Momo are all quite oblivious to the drama as they deal with their own. Nino is devastated that Momo will most likely disappear back into the night, never to be seen again. Yuzu finally can’t take it anymore and professes his love to Nino and kisses her. Momo, not wanting to be outdone or outclasses, also professes his love but adds a new, intriguing layer. His family has been hiding a secret that has kept him away from Nino. His father ruined the family name and got into severe debt. They’ve been on the run ever since. But, once Momo’s music started making money, his mother saw a way out of their problems and became tyrannical. She demanded Momo to focus only on work and make as much money as possible. This has been driving him slowly insane, but he is finally ready to break away from it all and return to Nino. Nino is of course torn between her two friends. She knows that Yuzu and his music are her true inspiration and without him she would be lost. But, the promise of a long lost love reunited are too tempting to pass up. She chooses Momo. They leave together holding hands and making promises for the future. The ending really stuck the landing for me in these two volumes. For the past 4 or 5 volumes I felt like we’d become trapped in a foggy loop. Nino despairs, Yuzu fixes Nino, Momo swoops in to take all the credit or throw a wrench in the plans, Nino despairs…and so on. While volume 10 definitely started to fall into those lines, Volume 11 really began to shake things up. Volume 10 plays out the last concert of their tour. As expected, Nino is both better than she’s ever been, but also more emotional than ever. Yuzu has fallen back into his ‘throat disease’ affliction and cannot sing…until the last possible second when it really matters. Magically, his love for Nino has cured him. How fortunate. Momo does his usual, aloof Momo thing. No big surprises or story lines here. I think one thing I was a bit disappointed about was Miou’s story line. I was hoping for her to grow beyond unrequited love. I was expecting her to become stronger in her independence and self-reliance which would then attract more suited attention. But that was not meant to be. Instead, she goes on a super awkward date with Haruyoshi. She can’t look him in the eyes, pulls away every time he gets close, and gets flustered when he calls her out on it. Not my favorite moment for Miou. Story wise, I was happy to see the Fukuyama shake things up. I still don’t know if I can fully root for Nino and Momo. I’m still not over his rude and childish behavior from the last…9 volumes. Then again, Yuzu isn’t much better with his possessiveness and sense of entitlement to ‘make Nino his and his alone.’ I’m probably just not the right audience for this particular love triangle. I’d rather see the men pine over a strong, self-sure confident girl rather than having two emotionally damaged immature boys fight over an equally emotionally damaged, unsure girl. Now, don’t get me wrong. I really love me some love triangle drama, but it just has to be a bit more compelling and emotionally mature for me. To get technical now, I feel like the art style has taken a bit of a shift the past couple volumes. It’s always been a more chaotic and frenzied style, but there are some panels in these volumes that feel really unpolished and rushed. The artwork becomes more blocky and cartoonish than normal and feels more like a quick sketch than anything else. The concert scenes are still great, lots of emotion and movement through the panels. I am still finding it difficult to follow some of the dialogue and story lines across the page. Fukuyama like to mix in pieces of dialogue with internal monologue that makes the speaker’s voice lost in the noise. My brain keeps trying to read two different lines of thought as one cohesive idea and I get the wires crossed. Overall, I think the series is taking an interesting turn. The next few volumes will probably take a deep dive into Nino’s uncertainty and guilt over jilting Yuzu. Especially if he leaves for more than half a volume. I wonder if Nino will begin to doubt her decision once she gets to know Momo a little better. 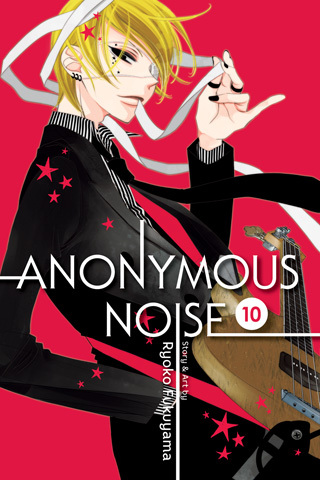 If you haven’t already heard, Anonymous Noise has an animated series and a live action movie released last year. The animated series landed itself on a couple of Best Anime of the Year lists, while the live action has also fared decent reviews across several platforms.